The Combine Forum > thecombineforum.com Forum Tech Support > thecombineforum.com Forum Help Desk > Global news is blocking my view. Global news is blocking my view. 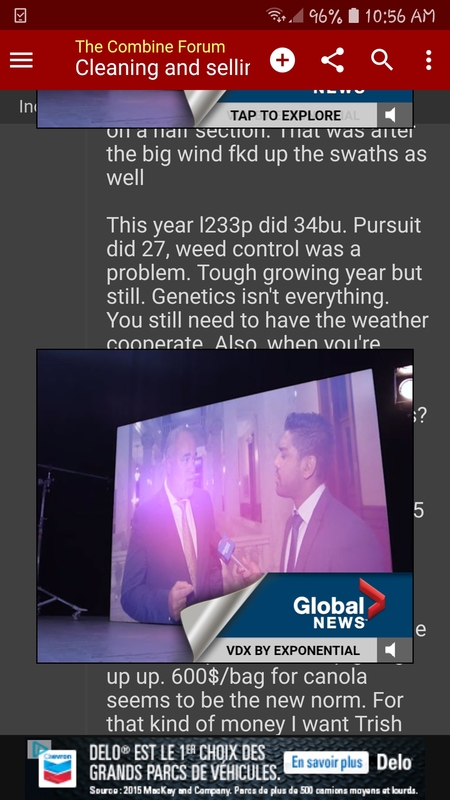 When I scroll down a bit there is a pop up ad for global news that blocks half my screen and if I try to get rid of it I end up with it full screen and the news is not what I want to see. It’s super annoying so can you remove it. Have you considered using an ad blocker? Here’s their item they should feature in their pop up, and try to square that with fuel and carbon taxes people are paying. Edit: Jeezz that pop up dissapered in 8 minutes. Weird or What? It’ll likely be back. Last edited by Haystack; 11-17-2018 at 10:28 AM. I use my I phone to look at this site and never have pop ups come on before. And as haystack said it’s gone now. I think it was a ad gone wrong. Thanks to whoever removed it. Next time this happens, grab us a screenshot. Also, mention what browser/device you're on. is the global news ad the only one that follows you like that? Yes it acts unlike any of the other ads I see. But I personally have only seen that global ad once... when I took the screen shot... and not since. I reported this to our adissues guy and he needs the ad redirect. Last edited by Administrator; 11-26-2018 at 01:31 PM.